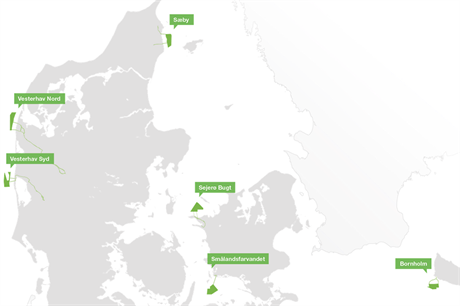 DENMARK: The Danish Energy Agency (DEA) has qualified three companies to take part in the 350MW nearshore tender in spring 2016. The DEA is holding an auction for up to 350MW of capacity, across six potential nearshore projects. Vattenfall is the only single company to be shortlisted. The Wpd Hofor Danish Offshore Consortium and the European Energy Nearshore Consortium have also qualified. German developer Wpd and Hofor, a Danish utility, formed a partnership to develop Danish offshore projects in March 2015. Danish developer European Energy formed its consortium in November 2014 consisting of two joint ventures. The first is with Canadian developer Boralex, and the second is with Dutch bank NIBC. In February, Swedish state utility Vattenfall won the rights to develop the 400MW Horns Rev 3 project in the Danish North Sea. The DEA launched the tender in February 2015. It said the smaller project sizes and lower costs required to participate in the auction could encourage new businesses in the sector to bid. The nearshore sites will be called: Vesterhav Nord, Vesterhav Syd, Saeby, Sejero Bugt, Smalandsfarvandet, and Bornholm. Each area can hold up to 200MW installed capacity, except Bornholm, which has a maximum capacity of 50MW due to grid limitations.